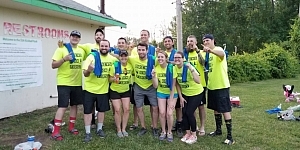 Syracuse Sports Association Kickball Leagues Now Forming! We here at the Syracuse Sports Association have brought a fresh new twist to the Syracuse adult recreational sports scene. Kickball... yes, just like you played in 5th grade. Registration for 2019 Kickball is OPEN! This great playground pastime is no longer a past time and a game you played in your back yard growing up! Kickball is back with a vengeance for adults 18 and older to enjoy nearly any night of the week! Since our official creation in late 2010 we have grown by leaps and bounds even surprising ourselves at times with the awesome size of our leagues! SSA's goal is simple HAVE FUN first, win or lose second. We are firm believers that there are plenty of times to be serious and worry about the little things in life. THIS IS NOT ONE OF THOSE TIMES. We encourage good sportsmanship, Team comradery, rivalries, cheering and general FUN! If you are that individual looking to for an extremely competitive sport than our kickball leagues may not be for you. But if you are that individual looking for that way to break up the BORING work week, get out enjoy some great friends and kick a big rubber ball around then WE WANT YOU! Remember and we can’t stress this enough, the idea behind kickball - past and present - good sportsmanship, have fun first and win second. I mean Win or lose, there is nothing better than being outside and having fun with friends. And, the upside (Not like you really needed any more) of kickball for grown-ups is the chance to go to a local sponsor bar after the game, socialize and hang out. Lastly, we want to thank everyone for playing, without everyone’s shared excitement for this game SSA would not exist and we wouldn’t be having all this awesome fun! Please feel free to contact us anytime with any questions you may have! Good Luck on the fields and once again THANK YOU for playing!